There's something that's just right about the way the Ping Redwood Anser looks behind the ball. It could be the classic Ping Anser design, or perhaps the milled stainless steel head. Either way this is one attractive putter. The sight line extends from the back of the hitting surface to the back of the putter, and this combines with the largely square design to give you an easy putter to align. The Redwood models are available in a black finish too and these make the white sight line stand out even more prominently, whilst obviously reducing sun glare. All in all you get the impression of solidity and quality when you address the ball. All good things, of course! Ping have not scrimped on any of the materials in this putter - it's made from the finest 330 German stainless steel that Scotty Cameron putters are made from. The feel off the Ping Redwood Anser is responsive, not dull. We absolutely love it. 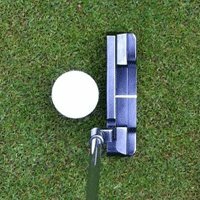 You just don't get any surprises from this putter at all, and can use it equally well on lightning fast and slower greens. We found the roll off the face to be almost as good as any we've tried. The Redwood is easily on a par with a Scotty Cameron, an Odyssey or a Yes putter. This is Ping's answer to the popularity of high-spec, high-end Scotty Camerons and the fast-selling Odysseys and it is clearly able to keep up with the competition. We haven't found a putter we like an awful lot more than this!